Will you change the UI of the game? Are you going to change the interface soon? Can we have the old layout in-game? [Q 1-2] We will change the UI. We will not do it soon. We aren't fans of the orange but we simply think other things are more important. Plus, at the first glance, it's a more complicated subject than it looks to be. 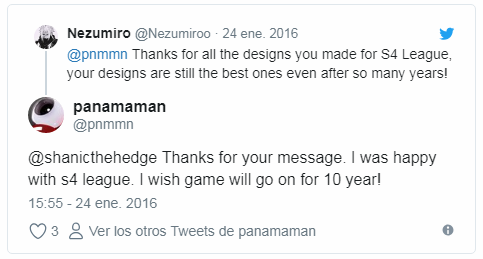 It is planned to transfer the game in a new engine? New graphic and different server. Many of my friends who isn't into S4 League always complained about the graphics of this game. Is it ever possible to improve the graphics, improve the engine of this game? Is it possible for you to recreate this game with better coding, engine and graphics? [Q 3-4-5] No, I can tell you we won't transfer the game to a new engine. However, we will have some infrastructure changes that affects the server performance and we just talked recently about the ways we can try to upgrade the graphics. We aren't sure what we can do at this point. It could be optimization of engine, it could be simply using higher res textures. If we find more about the previous downgrade of graphics, we will also look into that. We have no idea at this point how it was done. But if the engine has unused capacity, we'd love to upgrade to higher res textures and even apply it to old sets as well. So, no promises on what exactly we can do, but I promise we'll look into it. Will you upgrade the proud net library to the latest version? The one which is used by S4 League has an vulnerability. This was brought to our attention and we are looking into it, but at this moment we are focused on getting a patch out. It's high in our list though! It's not just a matter of implementation for us, there are also some legal implications for us and between us and Neowiz as well. Are there any plans to reign in the stats given by various items, enchants and chips? I'm getting melted by people with op enchants and chips. This is something I've been thinking hard about. I try to look at it from a PM perspective, from a player perspective and by evaluating various feedback we've gotten from the community. We can't just remove stats from the game. Not only people have earned them by playing or paying, but they are also part of game's design and add variety to the game. There are no solid plans yet and we'll definitely talk with the community, but the more possible ideas seem to be giving the option of no-stat games in more mods and/or making enchants easier to access up to a certain point. Is it possible to change the level rewards (they are not really a motivation)? We will definitely do this! It may not happen too soon as we are thinking of a system where the old players can also benefit as well. Maybe an endless leveling system? Can you make AP and gamble obsolete and focus on creating content as cosmetics Weapons and Clothes without the additional Buffs/ Damage/Defense? We are already creating cosmetic content and not adding additional stats like some games where you would have "super FP" "mega fp" stats etc. As for making gamble obsolete... I don't think that can happen, but we'd like to make the gambling more obsolete. If you are following our webshop, we've already been decreasing the amount of "You get a gold pen capsule or maaaybe a set" boxes and going for either better/guaranteed chances of items and better "compensation" prizes like reset insurance. In the end, if we can come up with a good model, we can do anything. But we need to make sure it works, it's fun and it stays relevant for players. What is the plan for increasing the player count for Unlimited mode? We don't have plans simply because we didn't think about it. We can definitely consider it. We may. We only have some plans on "mini" modes similar to the bomber or pass mode for now. It's a bit early to speak solidly about this to be honest. Will you bring back the toy block? To be honest, I don't know why and how it's gone. But why not? Can we expect changes to the clan system anytime soon or is it not that high on the priority list? Will you offer support for clans? Some peoples lost their clans, it will be a good thing to offer support regarding this. We currently have technical difficulties with clans. Our tools are really insufficient. Clan marks and clan support is high on our to-do list. We want to improve our tools and even if we can't, use some workarounds to provide support for clan issues and implement clan marks. Don't expect them like next week or so, they still need investigation, but it's a high priority. Glad to read all this answer, i'm really hyped to the August Patch and that Security fixes that annoy us. Once again it was very fun to watch. Basically, in the past you could get a permanent toy block if you collect all letters from the card system. The devs changed the rewards later on when new skills were added. The last change was the addition of the skill capsules but they didn't added the toy block in the list with rewards for some reason (back then everyone had many permanent toyblocks so that is probably why there wasn't much fuss about not being there). Basically the old level system required more exp per level so the only reason anyone may want it is because you could judge a player better for their playtime instead of everyone just being s4 level (lvl 80). The S4DB still has tracking for the old level system (not sure if it is still accurate though). Clicking on the level icon of a player in S4DB will switch between the new and the old level. A system with no ceiling would work way better for rewarding and showing playtime indeed. I'm just looking forward to the security patch, chipset buff/rebalancing, Collecting Book set buffs (maybe a new set that can complement the Amazon sets as icing on cake? o//_//o), Magnum Rebalancing, and the new Episodic Seasons. This game'll regain momentum, soon. pls, fix the blacklist i want play again.. The post was edited 1 time, last by B3mo ( Jul 27th 2018 ). reforming the clan / war clan system would be sensational I believe that there would be a boom where the clans would compete with each other and this would move more players, create a clan rank system and soon after that a patent system it would be necessary for the game to keep up with the other existing success games. of course before all this would be very good if you took out the ip block before so there would be more players to participate in the beta of all these new systems. I can't wait to see the changes we will get for S4. I really love these Q and A sessions! I'm most interested in seeing any graphic changes and also how the story line of S4 will proceed/change. Really gotta give Captain Kara credit. He answer a lot of question while he seem sick and the Q&A is much longer than last time. Bravo, thanks giving your time with us. could someone tell me vvtf is LATAM? maybe is because it is not build to be changed while other things like adding items etc have more flexibility. After all, the devs had to add new items every patch so at least they should have made that one easier to do. So nobody mentioned the problems with certain weaps ( RAIL GUN, BOOTS, BOMB) or maybe that was all adressed in the previous Q&A. Cause in my humble opinion those are core gameplay elements and should worked on 1st. ( just an opinion boys). On 1st? On 1st is stability, functionally and access of the game. That means, connection, Black List and all related to that. To be honest, i needed and i'm taking a break from S4, i will and more than probably, rejoin the netsphere once you guys get some neat stuff out (Visible to the user or not). These sessions are pumpin' my hype up for the new team so my best wishes to you all! Fixing the clan system will get a lot of players to come back to S4 League, you should focus on that cause fixing bugs and hacks is nowhere near your capability. Sounds harsh i know but it is what it is and a fact. The focus is on allow players to play the game or at least access without problem, those blacklisted, those with lag connection, server issues, and then ingame content. The post was edited 1 time, last by Newt ( Jul 30th 2018 ). Not sure why do you need clan system when we all know everyone just clan stacks 24/7 in pub games anyway. Are these one-time problems solved by now and has the development started? Asking doesn't necessarily equals getting what you want anyway. It is basically feedback. So you have the rights to ask, while the outcome can vary. I dont understand the qq'ing about clan stacking . Theres no difference in 7 friends in different clans playing together or 7 friends in the same one. Friend stacking isn't any better either except that one you can't even see it happening. You can always leave the room and join a non stacked room. Whats wrong with clans/friends playing together? Why should they restrict themselves if they want to enjoy the game together? To be fair it's a team oriented game for the most part. By stacking with a set team they can learn how to cover each-others weaknesses, and enhance their overall strength. If competitions arise where you must bring your clan to compete; wouldn't you want to be prepared? The best way to do this is to get in practice by working together with your clan/team. The only way to do this is by stacking. I've seen some good synergy from stacked clans. It's intimidating to enter a room and see yourself vs 6 people from the same clan I agree, but maybe more players should try doing this? Because it is already hard to find rooms (especially unlimited) and stuff like this doesn't affect the game experience in a good way. It doesn't helps that those rooms are also pretty common as well. Stacking vs randoms is just easy mode. The only reason ppl does it is cuz it is a free win most of the time. A CM hunt idea is a nice idea and we think about that before too. Seeing it like that, you're right. That's also important. So, like they said, They should start by fixing the access to the game, connection and then bring new content. I just had a game in Chaser and since kara said they met with the devs to get the game code, I was wondering how much their office resembled the Office map (if at all). It is technically the Pentavision office but i doubt they have moved their location anyway.